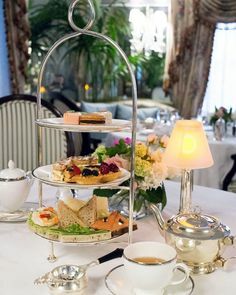 I recently wrote an exhaustive article on the Steps to Creating a Tea Party Menu and confessed that despite loving Tea Parties, I don’t relish time in the kitchen. 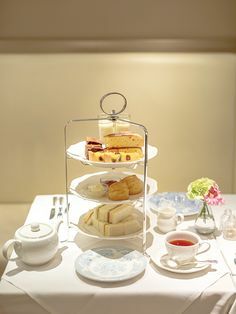 Currently, I am sharing the process of planning for my August Tea Party Event. The day to plan the menu is upon me. With high standards and a limited budget, I am determined to find The Lazy Baker’s Way to Plan a Tea Party Menu. Serve a cold summer fruit-based soup. A local deli makes wonderful cold soup in the summer. I will call them to find out how much a family-sized soup costs and what they will offer during that weekend. Serve a corn, tomato, pepper and basil-based salad. I will make this myself. Summer produce abounds and is relatively inexpensive. Almost everyone loves these flavors and it will be colorful. I can make it ahead of time and dress it at the last minute. Omit the quiche. The party is at 2:3o so it’s not a mealtime, decent quiche is expensive, and I don’t relish making it or eating it. Open-face traditional cucumber (they’re in season!) and butter on white bread cut with my teapot cookie cutter and garnished with edible violet flowers. Ask a local bakery (a new Safeway Lifestyles store) to make the scones, some bite-sized fruit tarts, and either petit fours or mini cupcakes. This is where I am willing to spend some money and compromise my love of all-natural food. It will save me so much time and emotional energy, it will be worth it. I will also serve jarred lemon curd and creme fraiche from Trader Joe’s. Buy some semi-decent chocolates at Trader Joe’s (I love Trader Joe’s-do you have one where you live?) to fill out the dessert-tier. Not the best season (the best time to buy chocolate at TJ’s is around the holidays), but my choco-holic friends won’t care and the price is right. Garnish with in-season green purple grapes. They’re heavy on the neighbor’s vines and the children will enjoy picking them. Pre-make Grasshopper ice cream sundaes~a recipe from a recent issue of Every Day with Rachel Ray. I will serve it as the last course on a day that will most likely be warm. But I will need to find an alternate serving vessel as much as I love the stainless steel martini glass in the mag pic. Make peach-iced tea and a Ceylon hot tea. 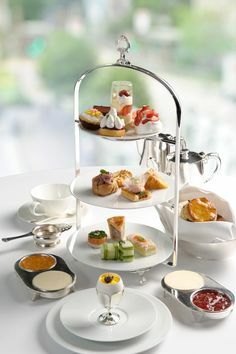 I would rather serve Darjeeling because it goes with more of what I’m serving, but I don’t currently have one in stock. I might as well use one of the many others I do to avoid another way to spend money. Save enough money for a decent bottle of wine. This group of girls don’t drink, but Plays with Fire and I will enjoy sharing a bottle of Riesling on the back deck when it’s all over. So what does this mean for this lazy baker exactly? Tomorrow I will post my shopping list to make sure it is reasonable and within the budget. What do you all think? Am I on the right track? Obviously this is just my opinion, but I think you don’t need the sundaes. With chocolate, scones, fruit tarts, etc…the sundaes would be overkill, in my opinion. If you do feel the need for something “ice-creamy”, I wouldn’t use such a strong, sturdy flavor as grasshopper mint (and green doesn’t really “match” your sea spa theme)…instead, I’d do a single scoop of lemon or strawberry sorbet in a small glass dish (if you have them), or on teacup saucers (perfect size). In keeping with the sea spa theme, you don’t want your guests to be *stuffed* afterwards, just pleasantly full with a clean palate. Personally, I’d omit the salad too…more “heavy” flavors (corn, tomato, pepper, basil), and you’re going to have a lovely cold soup, sandwiches, scones and toppings (which are very filling), and then all the rest of the sweets…it just seems like the soup and sandwiches would be enough. As you said, it’s not a mealtime. 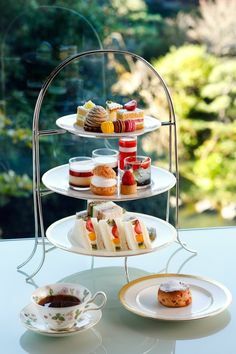 I agree that a Darjeeling (or even Keemun) tea would be better for the hot tea selection…maybe if you cut out one of the heavier food items, you could serve a darjeeling (which one should always have on hand anyways, right?). 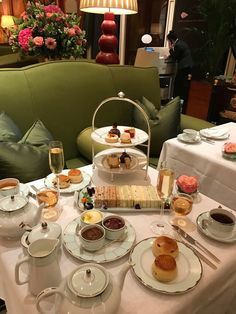 I’d also suggest a white tea selection for icing along with the peach iced tea…that seems to go over very well at my parties, as not everyone wants a black tea, even iced. I toyed with the sundae idea for this very reason so I’m going to think this through some more. But mint ice cream not a spa color? Maybe a little intense, but I plan on staying in the aqua, turquoise, etc. theme with lots of white thrown in. Says spa to me! Thanks for taking the time to leave your input, Jamie! I love reading your blog. Keep up the good work! My comment is about the salad, not that I think you don’t need one, but I am curious what kind of dressing you planned to use, if any. I don’t live near a Trader Joes but Bissingers, ah, Bissingers. They have the best dark chocolate covered berries. Your menu and the way you’ve broken up the preparation is wonderful. Alright, ladies, here’s an update on my menu adjustments. You all know how I love spending time in the kitchen. So it was easy to ditch the salad and sundaes per your advice. I decided to substitute sorbet which made me ditch the cold fruit soup. The result? 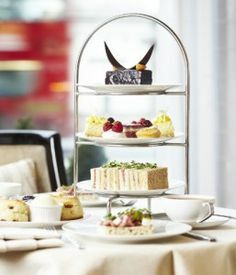 A true afternoon tea with a sea spa theme of light food. One course of the three-tiers with sorbet at the end. We’ll see how it goes over with my food-loving group. I’ll let you know.